The user interface consists of six main areas: the menu bar, the tool bar, the tree view, the setup view, the figure view, and the message bar. The following figure shows the user interface with the LTE FDD test 7.5 Adjacent Channel Selectivity (ACS) selection. The menu bar and tool bar lets you select various functions. Use the tree window (far left view below the tool bar) to navigate to the various settings such as the signal generators, PXB, technology, and test setups. Make a selection in the tree view to display the settings in the window to the right. Some tree node selections have no settings associated with them. Typically these are the upper level selections that expand the node selections such as the Hardware Connection and Settings node. 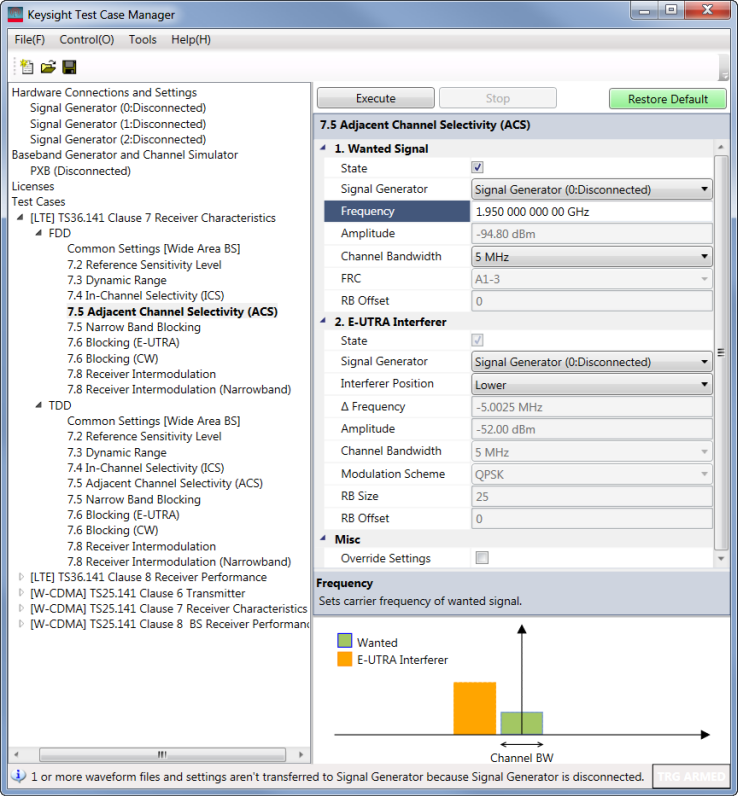 In the figure below,while Hardware Connections and Settings has no associated settings, the lower level selection for Signal Generator (0:Disconnected) does have associated settings. The window on the right side below the tool bar provides the buttons and settings based upon the tree node selection. The test setups, by default, are configured in accordance with the standards. The default settings can be changed. Below the settings resides the hint that describes the currently selected setting. Below the hint, where applicable, the software displays a graphic that visually depicts the signals from the selected test. Below the tree window resides the message bar that displays the outcome of actions such as making a connection to an instrument and exporting an scp file. Click on the different areas of the graphic to view information.